One of the many Buddhist temples in Chiang Mai. Earlier this month I embarked on a long trip from Malta to Chiang Mai, a city which can probably fit the bill as the world’s ‘unofficial blogging capital’. While I was researching new destinations for my digital nomad lifestyle, Chiang Mai kept coming up, and so in the end I decided that it fit the bill perfectly. I could escape Malta for the winter and continue living the summer lifestyle in Thailand. I had never been to Asia so this seemed like the perfect opportunity. Me and Alyona flew from Malta to Bangkok via Cyprus and Dubai with Emirates Airways. We stayed in Bangkok for a few days as we got accustomed to the totally different culture. While I found Bangkok to be way too hectic for my tastes, I still enjoyed our days there and the hot weather was just what I needed. 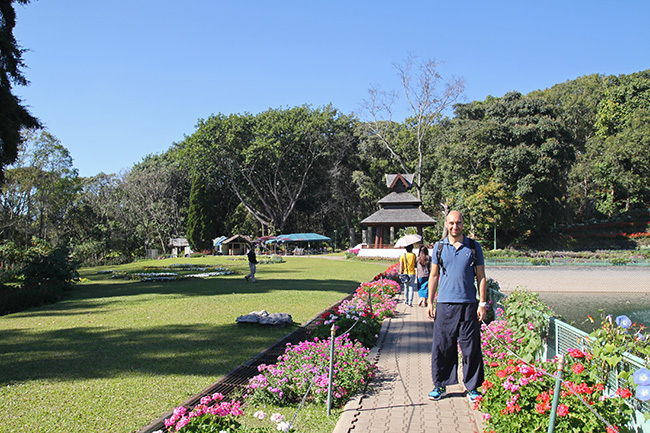 A one hour plane trip with Bangkok Airways and we were in Chiang Mai. My first impression was that the weather was even better here, less humid and a few degrees less than in Bangkok. I immediately felt the laid-back atmosphere that pervades this Northern city. Good start. Our first week was spent searching for a quality apartment with a reliable internet connection, which was not an easy task considering we landed bang right in the middle of the peak season. Once we settled into our apartment however, I quickly realised that we had made a great choice in coming to Chiang Mai to get some work done and make the most of the location independent lifestyle. There’s so much to do here if you feel like doing something, while on the other hand it is a perfect place to work from if you just want to put your head down and concentrate on your projects. If you want a culture-filled experience, it doesn’t get much better than this. From the classic and daily ‘Only in Thailand’ scenes like dogs riding as pillion on motor bikes to the fried bugs available at the many street-side food stalls, just stepping out into the street will guarantee you an infusion of Asian culture at its best. 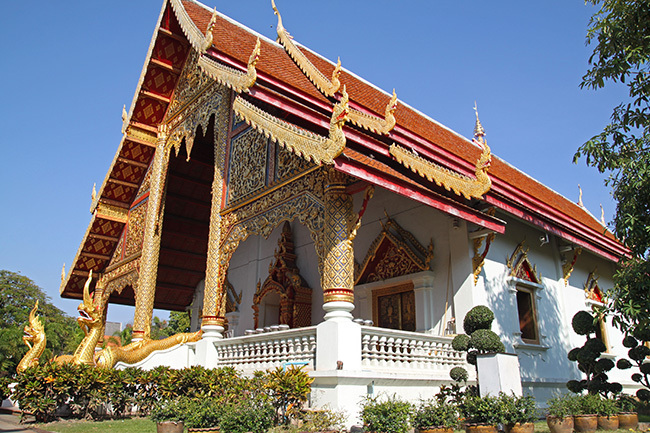 There are really a huge variety of things to do and experience here in Chiang Mai, and you’re not likely to get bored. If you’re ok with giving up traveling in comfort, transportation around Chiang Mai is fairly easy. There are no public buses here, although they had been introduced for a short period around 2 years ago. I’m not sure why they didn’t last long. My favourite is the songthaew (pronounced songtiao), which is nothing more than a customised Isuzu pick up truck. They basically add two benches at the back of these trucks, and add a canopy. 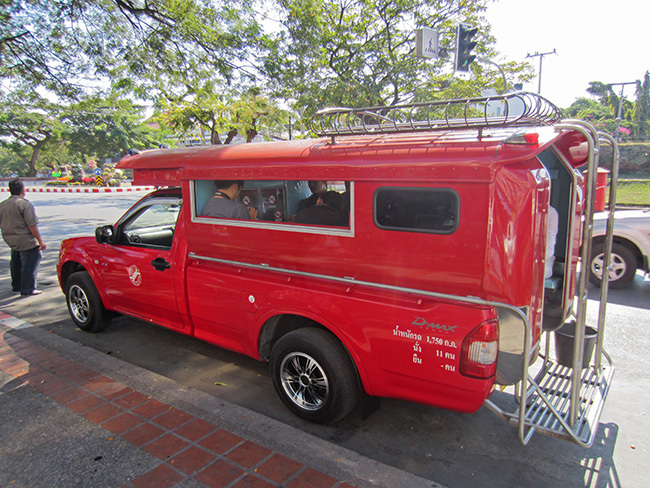 This is the most common means of ‘public transport’ here in Chiang Mai, and they can also be rented for private trips. Trips within the city will cost 20 baht, with the cost rising for outer city trips. I usually just confirm the price with the driver before hopping in, to avoid any hassles when alighting and paying. It’s also a good idea to have the exact amount to avoid the ‘no change’ scam. Songthaews are everywhere, and the ones you will see close to the old city are all red. You just wave your hand to stop them, ask if they are going to your destination, and if they accept you just hop in at the back. You can ring the bell when you are close to your stop to remind the driver, although he will usually remember without prompting. Tuk tuk in Chiang Mai. Tuk tuks should be tried at least once for the experience factor while you’re here, although songthaews are cheaper and probably faster. You won’t have any trouble finding one of these either, as they are parked close to all markets and landmarks, as well as roaming the streets. 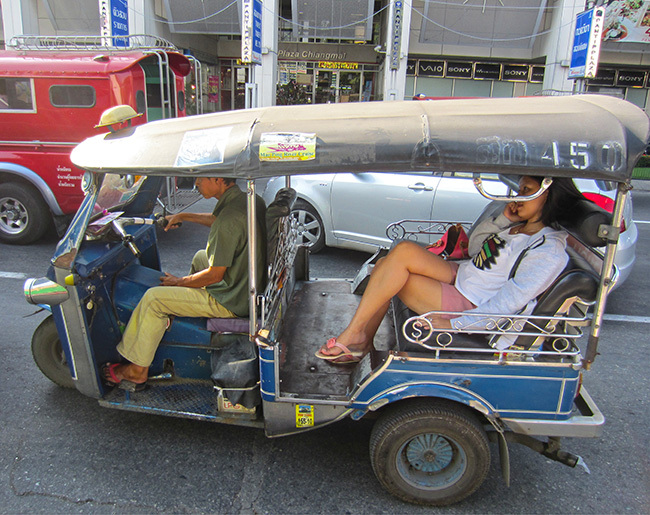 The price for a tuk will be in the 50-80 baht range for city trips, and they fit around 3 people. I’ve also seen a tuk tuk carrying four people plus luggage on a trip to the airport, but that was one of those ‘Only in Thailand’ moments and I definitely wouldn’t recommend that in terms of safety and comfort. 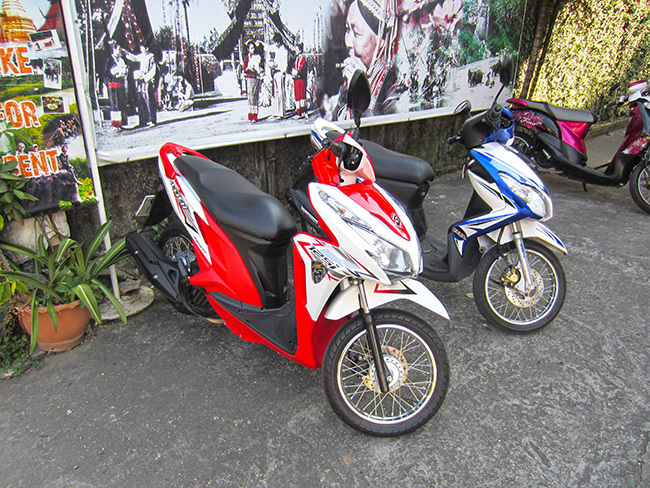 Renting a motorbike can be a very cost effective and fast method of transportation in Chiang Mai. Motorbikes are easily the most popular form of transport with the locals, and you will find a shop renting scooters on every corner of the street. Prices for scooters range from 150-250 baht, depending on the model and its age. It is recommended to be experienced with riding a motorbike back in your home country before attempting to ride one here, although they won’t ask you for your driving licence when you go to rent a scooter. 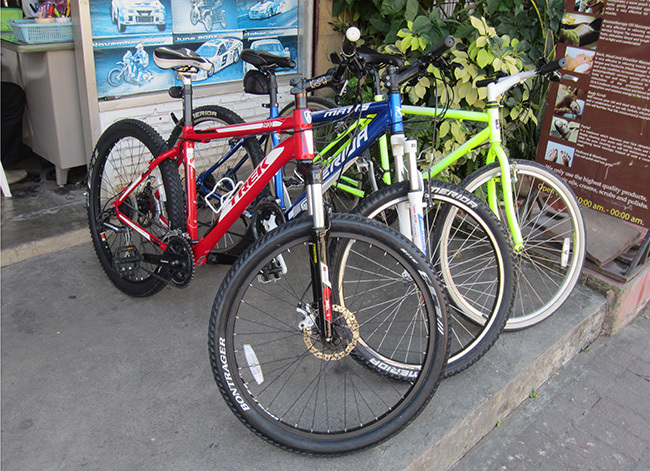 Bicycles are a great way of touring the Chiang Mai old city as there are no hills. A bicycle can be rented from 70-200 baht, you pay more for a decent mountain bike, but the city bikes are just as good since you won’t be using any gears. Bicycles were essential while we were looking for an apartment, as they allowed us to quickly dart from one place to another over town. You need to ride very carefully when in the main roads however, as you will be competing for road space with trucks and dozens of buzzing scooters. With all these cheap transportation options, there’s something for everyone here in Chiang Mai. There are many cafes here, since Thais have a culture of eating out instead of cooking inside their apartments/houses. I’ve been pleasantly surprised to find out that many cafes have very fast internet connections, and this is not only limited to the fancy touristy ones. Even the eateries which are little more than a converted garage, often have excellent wifi connections in the range of 8-12 Mbps. That’s a very good thing for digital nomads, if you don’t have internet at your apartment you can spend time in cafes. I always prefer having a good connection at my home base, but I still love to spend a few hours working at a different location just for variety and for socialising. This is definitely the perfect time to visit Chiang Mai, as outlets are realising the potential in catering for digital nomads and bloggers. You can even find dedicated co-working spaces, where you can rent a desk per month (around 2,500 baht). This is definitely one of the biggest pluses of spending time in Chiang Mai. You can easily meet some of the most famous bloggers here, especially those who love to travel and live the location independent lifestyle. Every digital nomad comes to Chiang Mai some time or another, so you’re always bound to meet someone here. Moreover there is an active barcamp meetup community, as well as co-working events which you can use to meet other like-minded people. Chiang Mai is a good place to head out to if you want to keep your costs down. A great apartment will set you back $600-$800, but you can easily live in a studio flat for way less than that ($300-$500). Street food is also extremely cheap, although you probably won’t want to eat fried Thai food every day in the long run. That’s why an apartment with a kitchen turns out to be very handy if you’re spending a few months here. As I’ve already mentioned, transport is also cheap, and when it comes to entertainment, it’s easy to spend a night out without breaking the bank. The weather here during the winter months is pretty much perfect, hot during the day (but not too much), and cool in the night. I’ve never had to use a jacket and I swim and train at the gym most days. When you’re coming here to escape a cold winter things are even sweeter, and you really appreciate the sunshine here. All in all Chiang Mai lives up to its reputation as a digital nomad friendly location, and you would probably struggle to find another place that combines all the niceties of living in this city. Have you been to Chiang Mai or are you planning to visit? Let us know in the comments section below! I just visited Chiang Mai and want to do a longer trip soon! Anyone actually living in Chiang Mai? I am looking to travel there next month to focus purely on becoming financially independent. I would love to connect with other like minded people. I’m in Chiang Mai at the moment. 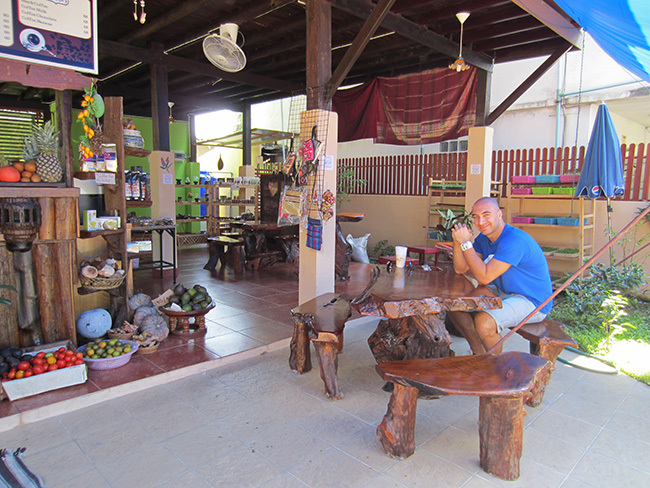 The good news is that it is much better than what I had described in this post, it’s really digital nomad heaven. To connect with others join the ‘Chiang Mai Digital Nomads’ group on Facebook. Do you like Pad Thai Jean? What other food do you enjoy? 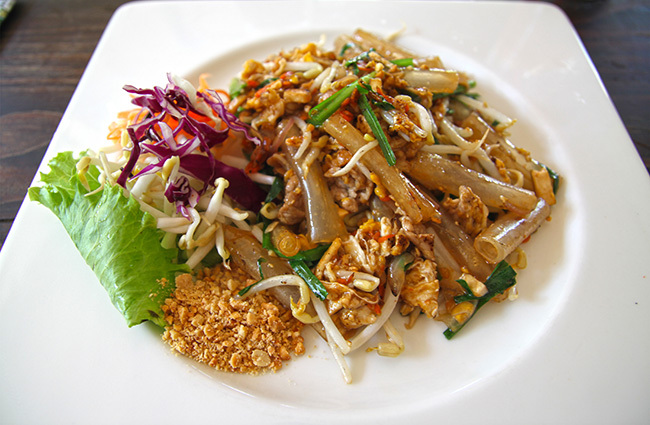 I definitely love Pad Thai and I must say that Chiang Mai is a wonderful place for healthy vegetarian food too. I’m not vegetarian but I still enjoyed these kind of dishes. Good information about Chaing Mai .Its useful for me How to do for travel in Chaing Mai how safe is Chiang mai, to live?. Thanks for your article. @Adam Nice find with Vanessa’s motorbike hire, hadn’t heard of that one before. Seems legit enough. The one where we hired was just outside our apartment, and also gave us a lesson to start off. The Scoopy we rented was brand new as well, so it wasn’t a bad deal, compared to the 3,000 on offer from Vanessa’s. We’ll definitely check out the areas you mentioned when we’re back in Chiang Mai, thanks for the tip. whaat? those are rip off prices!!! you can get a modern apartment in the university area with double bed, en suite, balcony for $100 all included. If you really wanted to scrape the barrel, you could find a place for half that price. You won’t find these places through agencies or online though, you need to go around knocking on doors..
Adam, that’s what some people say, and I really wish it is true. On the other hand, speaking from our own experience, I didn’t find any decent places at those prices. I’d really love to see some photos of $100 and sub-$100 places as you describe. It was something around 3200 bhat for rent, minimal bills on top, minimum 3 month contract (there were other places nearby without the 3 months minimum) – if you go looking around that area when it’s university holiday you can negotiate for better terms. Thanks Adam, while I’d still prefer where we stayed for various reasons, this residence seems like a great deal at that price. It also depends on the season, we went in mid-December and it was really hard to find anything available then, even though we did go around. With regards to motorbikes, it’s the same story, I’ve also heard about 2000 bhat/month motorbikes, but after going around I couldn’t find anything near that price for a new scooter from a serious looking dealer. It was run by an English guy and his Thai wife. Met another English guy who ran a motorcycle shop with bikes that cheap somewhere near the North Gate. Moved into the apartment previously mentioned at the end of November, there were a number of other places in that neighbourhood and Chiang Puek around that price range. None of these were advertised at all though, we ended up knocking on a lot of doors! Been to the islands and Phuket but never Chiang Mai. . Have you any accommodation recommendations? Hey Adam, I’m sure you’ll love Chiang Mai. For accommodation we stayed at Twin Peaks (see this post: https://www.alyonatravels.com/the-cost-of-living-like-a-boss-in-chiang-mai/), and Smith Residence is also popular with other nomads and expats. Since there are new condos being built all the time, we recommend you allocate a few days to drive around to each of them and check whether they have any available apartments. Another option is to go through an agency (Chiang Mai Properties being the biggest one). We were living in Chiang Mai for around 4 months and reading this post brings lots of memories back. Will be back within the next year that’s for sure! We’re in India at the moment and even though the food here is great and is cheaper than in Chiang Mai, some of the more expensive hotels are even struggle with their internet connections! Not ideal! PS My favourite part of Chiang Mai was the Moo Kata’s. India sounds great, would love to make that part of our next travels. We just got back to Malta (another ideal digital nomad destination), but will probably travel again next Winter. Internet is always one of my top priorities since most of my work revolves around WordPress development. Hey, great post! I’m contemplating moving here for a year of teaching English, and to also start up a travel/vegan food blog, being a young female who will be living by myself, how safe is Chiang mai, to live? At night? Etc etc. Jasmine, glad you like the post. Chiang Mai is the perfect place to start a blog, with so many other bloggers and online workers around to encourage you and give you any advice you need. That was one of the main reasons I came here. You will find Chiang Mai a very safe place to live, provided you keep your eyes open as you would in any other country. There doesn’t seem to be much risk of theft, I’ve seen people leave bags and jackets on their motorcycle while they go shopping at the mall for a few hours. The crowded market areas didn’t look like they were affected by a pickpocketing problem either. I haven’t been to the night life areas that much, so I can’t vouch for that, but the general consensus is that Chiang Mai is a very safe and hospitable place. I would also suggest that you rent an apartment (or share one) in the North Western side of the old city, close to Nimman Haeminda road. That’s where most of the young foreigners are based. Another good area is the South East area by the night market and the river, there are a number of condominiums (having 24/7 security and other perks) albeit they are a bit more expensive. I’m landing to Thailand the 4th of February for my second digital nomad adventure. I’ll probably be in Chiang Mai around the 10th and I’m planning to explore the digital nomads community and lifestyle. Hi Jonathan, glad you like the post. I’m still in Chiang Mai and I will be here throughout February, so we can catch up sometime.